As many of you probably know, the term “gamelan” refers to an entire ensemble of instruments, as well as the music played by said ensemble. A gamelan consists of bronze gongs of different sizes and bronze keyed instruments that look something like a xylophone. Percussion, fiddle, flute and voice may also be included. Each gamelan is a unique set of instruments with it’s own sound, tuning and character. Instruments from one gamelan cannot be interchanged with another ensemble. 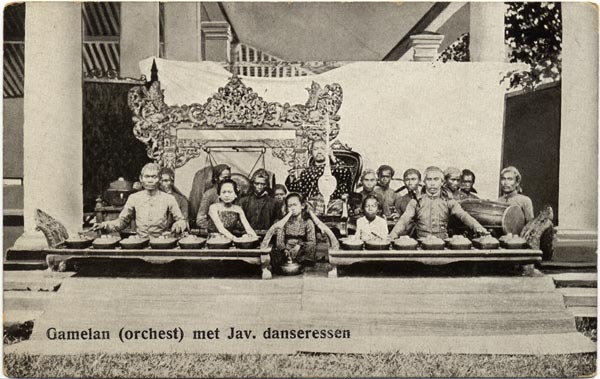 Most Balinese, Javanese and Sundanese gamelan are tuned to one of two main scale systems, pelog and slendro. Pelog has seven pitches and is reminiscent of a Western major scale, although notes don’t exactly match up. Slendro (or salendro in Sundanese) is a five note scale in which all the notes are basically equidistant, something not found in western music. It’s important to remember that each gamelan has a unique version of these tuning systems, not to mention the range in which it’s tuned. The music played by a gamelan is built in layers. Generally speaking, the higher pitched instruments play a denser more elaborate melody, more notes per minute. Lower pitched instruments play versions of the melody that are simpler and sparse. The important thing is that all the instruments land on certain important notes together. This concept of simultaneous variation is common throughout Southeast Asia. Check out the Vietnamese Vong Co recordings on this site for some other striking examples of simultaneous variation. Gamelan music uses interlocking patterns to create a temporal structure. The combination is termed “polyphonic stratification.” An academic term that creates a nice mental picture. As a student at the University of Michigan, 20 years ago, I played in the Javanese gamelan ensemble and my favorite moment was always when the lowest (and largest) gong would sound at the endpoint of each cycle. The effect was monumental as all the instruments concluded their melody and the low gong rippled throughout the room. You feel it more than hear it. 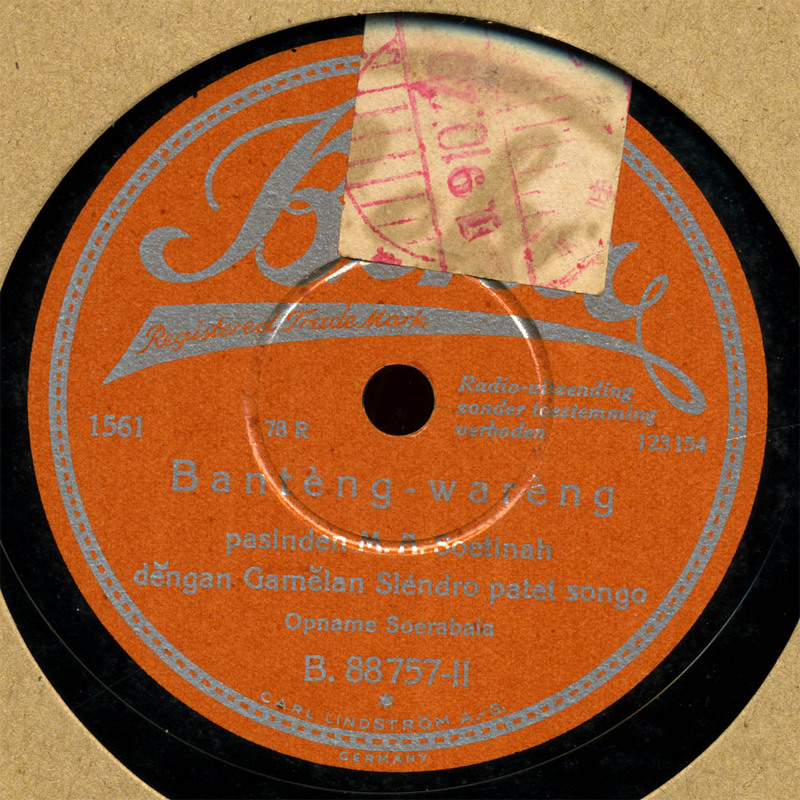 Gamelan music is hundred’s of years old, but the first recording label to venture to Indonesia, which was then called the Dutch East Indies and controlled by the Dutch, was the German label Beka, in 1905. They were followed a year or two later by Odeon. The Gramophone Company lagged behind in entering the Indonesian market. In fact, Odeon had come to dominate the Indonesian market to such an extent that in 1909 Frederick Gaisberg complained, “The business in Java for the Odeon company has been wonderful for the last two years, they being the only company in the field. The Odeon Company, during the last two years, have made two recording trips to Java, and are now starting on a third.” (Paul Vernon, Odeon Records; Their Ethnic Output). In 1911 Beka was absorbed by Odeon and around the time of this recording, in 1931, both labels were part of the huge EMI merger. Here’s a piece in the pathet sanga. Pathet is the Indonesian version or modes, raga, maqam, etc. Sanga is one of the three central Javanese modes in slendro. I believe this piece is from Surabaya, in Eastern Java, so the version of pathet differs from the Central Javanese. It’s sung by the pasinden (female singer) M.A Soetinah. Gamelan records are extremely hard to come by, highly sought after and usually pretty beat up. I’ll post a few of my more listenable records, but you should also check out 78 collector Mike Robertson’s youtube page. Mike has a fantastic collection of gamelan records (and more) which you can hear on youtube. Somehow, they seem to fall right out of the sky and into Mike’s lap! An amazing archive of Indonesian musics.